Last week I posted this outfit and then I saw the theme for today and I was like.... drats. I could have totally used those photos for today's post. Instead I had to create a whole new outfit and I'm so glad I did because I've found a new ensemble that I love and it's something I've never tried before. I'm wearing a basic t-shirt dress that I actually haven't worn in over a year, but refused to throw out because I'm a hoarder with my clothing. It lost two buttons in the front just over my chest and because I never sew, it hasn't been fixed - hence why I haven't worn it in over a year. I got to thinking, "how could I fashionably cover those missing buttons up?". Instantly a scarf was my go-to option, the only problem is it kept sliding away, revealing my chest. And then a light-bulb clicked when I saw today's theme. Add a belt! Viola! I love the creativity this link-up can pull out of us. You can see Jana's and our co-host, Jaelan's, full looks by clicking on their names. Aren't they both so beautiful? We all chose such different styles, I love it! As always we ask that you help make this link-up fun by taking the time to visit one or two or ALL of the other ladies who've linked up. And please share that you have linked up with us in your post or use this fancy-schmancy button below. 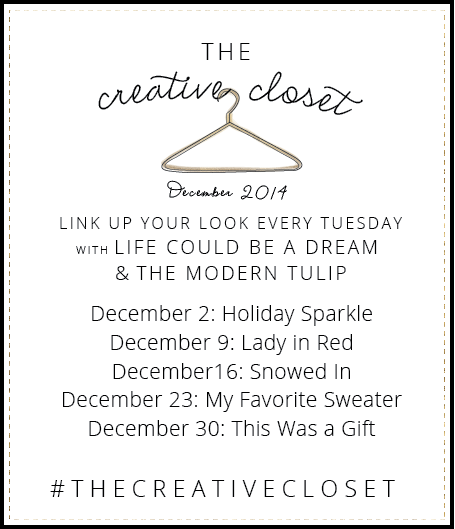 20 comments on "The Creative Closet || Just Add A Belt"
Aren't you looking cute! I love that green on you! This looks fantastic! I never would have thought of belting the scarf in front like that but it's adorable! I love it when I can throw together a hodge-podge outfit that works! Adorable!! You are the most stylish momma ever! I'm a hoarder with my clothes too haha, "but I might wear it one day!" Love your look and your messy bun and bold lip are perfection. So adorable! 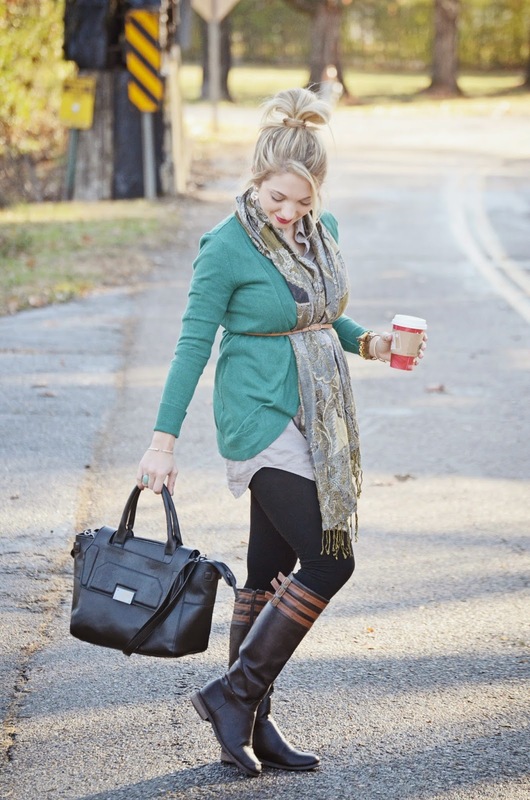 I love the layering and would have never thought to put the belt around the scarf too! Just a little heads up you have your co-sponsor wrong (should be Jaelan not Jaquelyn) and an old link up because I magically appeared on it and I haven't linked up in ages. I am planning on getting back on board for December though if possible! You are so cute!!! I love it! I need to get myself some black pants like that! I love your hair like that! Seriously! 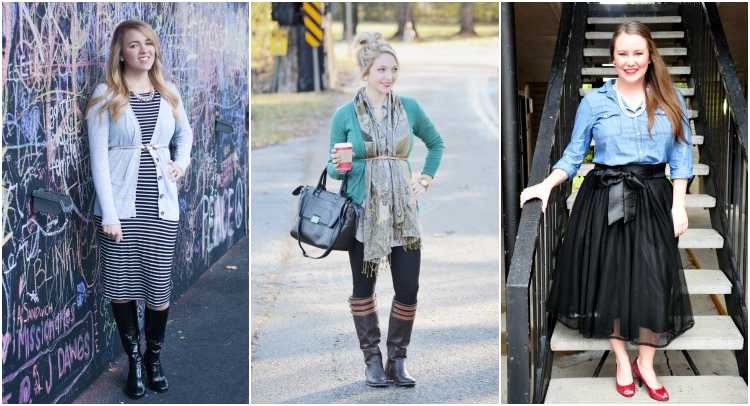 All you pregnant ladies are taking over the linkup this week! You all are so cute and not helping baby fever at all! I've loved the scarf in belt trend this year, what a fun mix up of our fav accessory! Also, I wish I was as adorable when rocking a messy bun! An ingenius solution to the problem! I think this looks great - the colors are fantastic in the cardigan and the scarf, and the ring picks up the green too...lovely :) And I always adore your accessories! You have such a way of using jewelry with your outfits perfectly. I haven't gotten the hang of layering bracelets etc yet! 1. how do i follow Follow the hosts and how do i know who the hosts are? I know you said the cohosts are the 1st 3 links but what is the difference between the hosts and cohosts? 2. Do i link back to this post every time there's a topic? 3. When i go to comment on others who have posted am i supposed to include a link back to my own post? 4. Can I post anytime through out the day? Or is there a deadline? Sorry for the bajillion annoying questions but I'd love to try this out! Thanks so much. You look just beautiful! I love this -- just the perfect outfit! Happy Thanksgiving! I absolutely love how you pulled the scarf into the belt - amazing!! I am such a hoarder with my clothes, and it doesn't help my problem that I've actually found things in my wardrobe from years ago and have fallen in love with them again - it just justifies the madness haha. I love that adding the belt really shows off the belly too! You are adorable as ever! Such a clever idea!!! I think I might be the complete opposite with my clothes, I get rid of the ones I don't wear religiously. It might be because I have limited space, so every inch of my closet is very precious. I look forward to the days of big closets and tons of space so I can keep everything;) Love the outfit!